← Book Fair Today in E100 Flex–Come check it out! Did you know the library has MAGAZINES? Magazine Rack in Reading Area! In the library’s reading area (with the soft chairs just after you enter the library), there is a shelf with numerous magazines from current and recent months. These magazines are for reading IN the library. The magazines cover a broad range of topics, from news and sports to hobbies and technology. Relax and read a magazine! Below are the titles we currently offer…but if they are not frequently used, they may not be around for long! 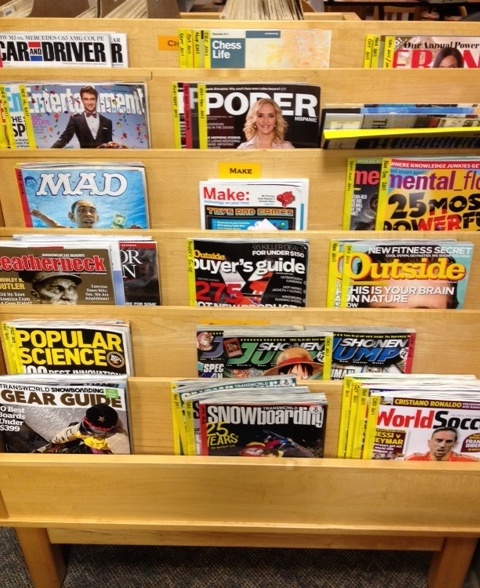 Let Ms. Wolter know if there is a different magazine you would like to see in the library. Posted on January 4, 2012, in Did You Know?, Library and tagged Did you know?, magazines, Reading. Bookmark the permalink. Leave a comment.